Seiser Alm, Italy – Finland’s Enni Rukajarvi, and Seppe Smits of Belguim, who had each earned the first-ever slopestyle world championships title back in 2011, have claimed victory in today’s third slopestyle competition of the 2016-17 World Cup staged under a bluebird sky at Seiser Alm. It was the first time that the Italian resort hosted a snowboard World Cup event, as many riders skipped the event to participate in X Games Aspen this week. Rukajarvi kept the momentum going following her triumph last weekend at the Laax Open, securing back-to-back wins by posting the high score of 81.70 in a close women’s best-of-three-run final of the top six qualifiers. It was the 2014 Olympic silver medalist’s third World Cup win. Canadian rider Laurie Blouin finished second with 80.50 and locked in her career’s second World Cup podium by edging out Swiss rider Sina Candrian, who scored 80.40. The men’s event saw ten riders going for the win, and here too things were also getting pretty tight with Seppe Smits earning his career’s third win (but first in slopestyle) with a score of 88.30, a mere 0.4 ahead of British style machine Jamie Nicholls. Nicholls’ teammate Billy Morgan was knocked off the podium by Belgium’s Sebbe de Buck, who finished in third to mark the first time in history that two Belgians stood together on the World Cup podium. 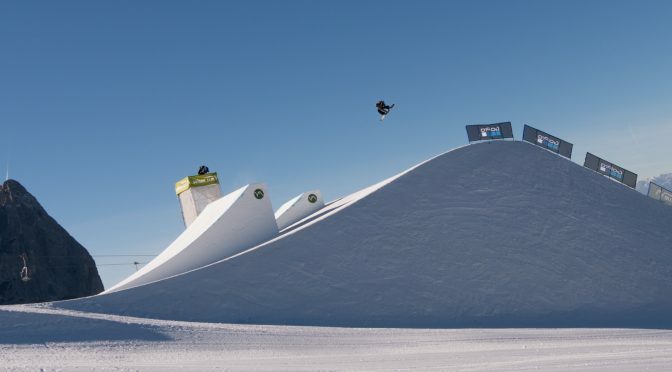 The snowboard freestyle World Cup tour continues next week with both a halfpipe and slopestyle competition slated to take place at Mammoth Mountain, Calif., Feb. 1-4.